You'll go on incredible adventures in the 2018 Palomino Columbus 378MB 5th Wheel! National RV Detroit in Belleville has been selling all the great, top brand RVs from all the leading manufacturers since 2008! As a top, full-service dealership in southeastern Michigan, we're committed to helping you find your dream RV at a dream price! We're conveniently located at 44700 N I 94 Service Dr Belleville Michigan 48111, so stop in and talk to us today. You'll be amazed at the deal we can create just for you! If you don't live in the Belleville area, don't worry! We offer personalized phone and internet service along with 24/7 delivery throughout North America, so we can still help you find your perfect RV and have it at your door in no time! It's never been easier to own the RV of your dreams, so stop in today or call us at 734-439-3400! This 2018 Palomino Columbus 378MB is ready to hit the road whenever you are! It has a very towable hitch weight of 2251 lbs. The 20' 0" patio awning provides outdoor shade and comfort. With a GVWR of 16251 lbs, this RV can handle your whole family with ease! 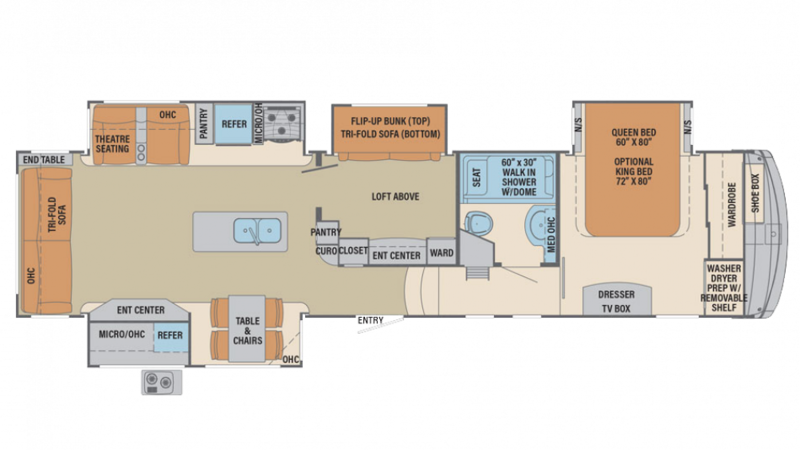 You'll live in handsome comfort in this 42' 1" long, 8' 5" wide 5th Wheel, especially with its 4 slides that optimize the interior space! And with the efficient 35000 BTU furnace and modern 15000 BTU a/c unit, the climate inside will stay pitch perfect and comfortable even when it's sizzling hot or freezing cold outside! This comfy camper can sleep your whole family, with its sleeping accommodations that sleep 7! Inside the master bedroom, you'll find a Queen bed, perfect after a long, tiresome day on the road! Meals on the road can be challenging. Eating out all the time is expensive, and fast food is fattening and low in nutrition! Thanks to the roomy, well-designed kitchen, you can stock the cupboards with cooking staples and fill the roomy 8.00 cu. ft. refrigerator with fresh meats, veggies, fruits, eggs, and juices! The 3 burner cooktop lets you whip up delicious hot meals for breakfast, lunch, or dinner every day! You'll be able to clean, drink, and cook with plenty of water from the 75 gallon freshwater tank! Do you enjoy a hot shower in the morning? You can enjoy one every day in the comfortable, convenient, and beautiful full bathroom! It has a roomy shower and a sanitary Porcelain Foot Flush toilet! With the big 75 gallon freshwater tank and 60 lbs. of LP tank capacity, there'll be plenty of hot water for everyone! Dirty water and waste are stored in the 71 gallon gray water tank and the 39 gallon black water tank, respectively. If the weather is gorgeous and the family is having a great time outdoors, don't miss any of the fun at mealtime! Thanks to the outdoor kitchen, you'll make tasty breakfasts, lunches, and dinners and still enjoy your time with the family in the sunshine and fresh air! You need a great night's sleep so you can enjoy every minute of your outdoor fun during the day! That's what your family will enjoy thanks in part to the big loft space! It's cozy, comfortable, and private, so kids or guests will drift off to dreamland in peace and quiet!